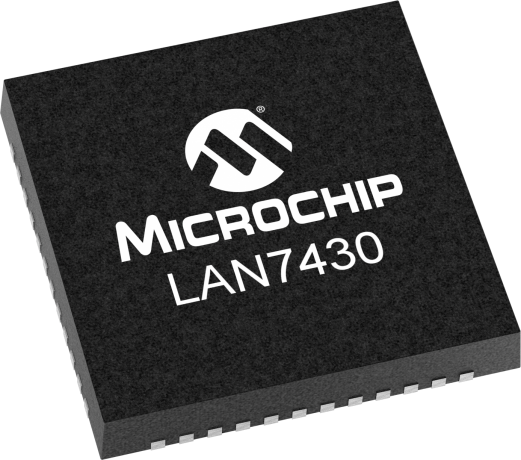 Microchip's LAN7430 is a PCIe 3.1 (at 2.5GT/s) to Gigabit Ethernet bridge, providing an ultra-high-performance and cost-effective PCIe to Ethernet connectivity solution. LAN7430 contains an integrated Ethernet PHY, PCIe PHY, PCIe endpoint controller, Ethernet MAC, Integrated OTP, JTAG TAP and EEPROM controller. The device supports 10BASE-T, 100BASE-TX and 1000BASE-T Ethernet with auto-negotiation, auto-polarity correction, HP Auto-MDIX† support and is compliant with IEEE 802.3/802.3u/802.3ab standards. PCIe-based networking provides flexibility for the routing and placement of network connections anywhere in the system. Specific enhancements for PCIe LPSS (Low Power Sub-States) L1.1 and LPSS L1.2 have been integrated to lower system power consumption. LAN7430 is available with a wide range of drivers including Windows®, Linux®, and Pseudo Code for development towards RTOS. LAN7430 also supports Precision Time Protocol using industry standard 1588-2008 PTP. GPIOs are provided that can be software defined for this function. Included within this feature is a programmable timer compare output that can also be software configured. The LAN7430 integrates all needed voltage regulators and requires only a single 3.3V supply. Further BOM savings can be realized through the integrated clock tree only requiring one external crystal or clock source. An EEPROM interface is provided although is not mandatory - an integrated OTP memory can provide for configuration data, further reducing system design cost and burden. Multiple power management features are provided, including various low-power modes and Magic Packet™, Wake-on-LAN (WoL) and Link Status Change wake events. Microsoft Connected Standby (CS) and Always On Always Connected (AOAC) is also supported. These wake events can be programmed to initiate a PCIe beacon, and if desired, also generate a hardware PME event. The device is available in commercial (0° to 70°C) and industrial temperature range (-40° to 85°C). †HP Auto-MDIX eliminates the need for special "crossover" cables when connecting LAN devices together. EVB-LAN7430 is a fully featured single lane PCIe adapter that enables evaluation of LAN7430.